Ryan, I don't have any pictures, but I know exactly what you are talking about. I've been religiously following Tony's instructions since the first of this year - making pizzas every weekend. When I first started, I too had dough balls that flattened out, but felt and tasted great. What I suspect is happening is that you and I are not getting a tight seal when we ball our dough. For me, it is difficult to get a tight ball because the dough is so sticky right after everything is mixed together. As a work around, I typically degas the dough balls after the first 24 hour cold ferment. When I go to ball the dough the second time, I find that it is less sticky and I am able to form a nice tight dough ball that doesn't flatten out as much. Steve, thanks a lot I think your right on the money! I've had a hard time mastering the balling process but it's getting better! I'll try to get a better seal and see what happens! I'll see if I can dig up some pics. If I can't find any, I'll snap one from the next batch of dough I make at some in the next couple of days. If you're happy with the end result, that's probably more important. 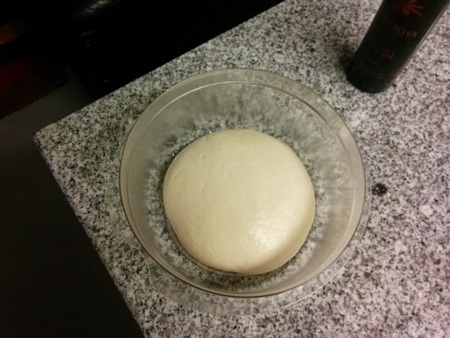 Most of the time I make dough that's lower in yeast and rises for about 2-3 days in the fridge. When this happens, the ball slowly turns into a disc. It does rise, but it certainly doesn't double, and it definitely doesn't look like a ball by the time I'm done. Raj, thanks a lot I definitely get a decent rise but a disc is a great description of what I end up with when it's time to cook. I'll look forward to your pictures I'll post mine as well from my next batch. You're welcome Ryan. I'm making a batch of dough tonight. I'll take pics through the fermentation process. Also, FYI, I updated the title of your post to be more descriptive so others with the same issue will be able to find it. Ryan, I have thought about posting the same question but never got around to it. I have been thinking about it and wonder if it might be related to how quickly the dough chills after being placed in the refrigerator that keeps it in a ball, although what was posted about the bottom seal makes sense, as well. I will be making some dough tonight and will chill it without a top on it for an hour to allow for air circulation around it before covering it. I use metal proofing pans or plastic Cambro 2 qt containers. In my thoughts about this, I have noticed that commercial doughs are stored initially in open stacked trays for a while before being covered, which is where my thinking comes from. I will see how it goes and report back. The bottom line: I am very happy with the flavor and performance of my doughs for Sicilian and neo-Neopolitan/New York pizzas. Thanks for the ideas Ken let me know how it works out. Here's a pic of some dough that's about to be stretched. Unfortunately, it's not the best angle, but you can definitely see that it hasn't double in size or anything like that. I'd say it grew by ~30% max. This is one my go-to dough formulations and always provides a great end-result in a high temp oven. I don't think it has anything to do with the way the dough was balled or whether there's a tight seal underneath or not. If you followed TG recipe to the T, it's most likely that the higher hydration and malt are responsible for the flattening effect. A higher hydration dough is always a little more sluggish and tends to flatten out more than its "drier" counterparts. Reballing helps since it provides additional strengthening of the dough and its gluten structure. I have to agree. When I was having trouble working with wetter doughs, Raj suggested that I back off to 60% hydration and work back up. Those balled doughs definitely kept their shape more than what I am working with now, which are in the 65-67% range. The other thing is that I use more dough than others may for their New York style--about 380-390 gm, and that extra weight would result in more flattening of a dough ball. So that suggests a combo of total bulk of the dough ball, degree of hydration, chill rate, malt, plus other unknown factors which may result in more or less flattening of a dough ball by 24hours. That is my uneducated guess-sessment. Thanks guys! The more batches I make the better thanks for the tips and ideas it's greatly appreciated!